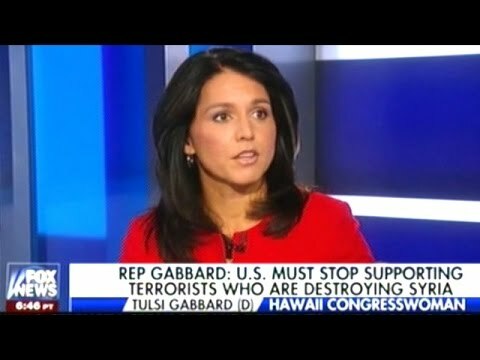 Finally: Tulsi and Tucker Push Back Against Trump’s War in Syria! After what seems like months of silence, Congresswoman Tulsi Gabbard has resumed her willingness to speak out boldly against the US failed foreign policy of endless Middle East wars. It was so refreshing to finally hear someone point out the massive contradictions in our post-9/11 policies of supporting the very group we accuse of being responsible for that infamous act. Gabbard is the sponsor of legislation designed for us “to stop funding terrorists” but her bill has few cosponsors. Senator Rand Paul has introduced a similar bill but it, too, has little backing by his colleagues. They join Virginia State Senator Richard Black in warning of the dangers of this approach and the lack of evidence to support the outrageous statements by Nikki Haley at the UN, John Bolton regarding the International Criminal Court and Rick Perry today in Moscow regarding the need for Iran to buckle to US demands. After campaigning on a platform of America First and disengagement from our endless wars, President Trump has reversed himself. This may be in direct response to the assault on his legitimacy by those claiming he colluded with Russia to win the election. It may also reflect his obvious pro-Israel stance as evidenced by his close ties to Bibi Netanyahu and Sheldon Adelson with son-in-law Jared Kushner acting as their agent in the White House. With Russia pushing back vigorously and condemning the spurious claims of a pending gas attack by Assad on his own people, the stakes are growing ever higher in the region. Although it is highly unlikely that the Tulsi/Tucker push back will affect Trump’s views, it is wonderful to see these gestures of sanity amid the two-party silence that implicitly shows bipartisan backing for his war in Syria.